'I Got It Wrong,' U.S. Ambassador Says About Muslim 'No-Go Zones' In The Netherlands : The Two-Way After initially expressing "regrets and my apology," he told a Dutch newspaper that comments he made in 2015 about Muslims burning politicians in the Netherlands were "just wrong." U.S. Ambassador to the Netherlands Pete Hoekstra spoke at a tense news conference with Dutch reporters Wednesday at The Hague. On Friday, he said his 2015 anti-Muslim comments were "wrong." "Chaos in the Netherlands. There are cars being burned. There are politicians that are being burned. ... With the influx of the Islamic community — and yes, there are no-go zones in the Netherlands." Hoekstra was speaking at a November 2015 conference organized by the conservative David Horowitz Freedom Center. But on Friday, he told the Dutch newspaper De Telegraaf, "That one shocked me personally. ... While you know there have been other issues in other countries in Europe, you know that has never been the circumstances here. That was a wrong statement. That was just wrong." The English-language excerpt of Hoekstra's interview was published by Reuters and other news agencies Friday. According to an excerpt published by The Guardian, Hoekstra said, "I got countries mixed up. I got it wrong, and I don't know how it could have happened." Hoekstra had previously said he "expressed my regrets and my apology for the comments that I made" but stopped short of saying the claim was factually false. 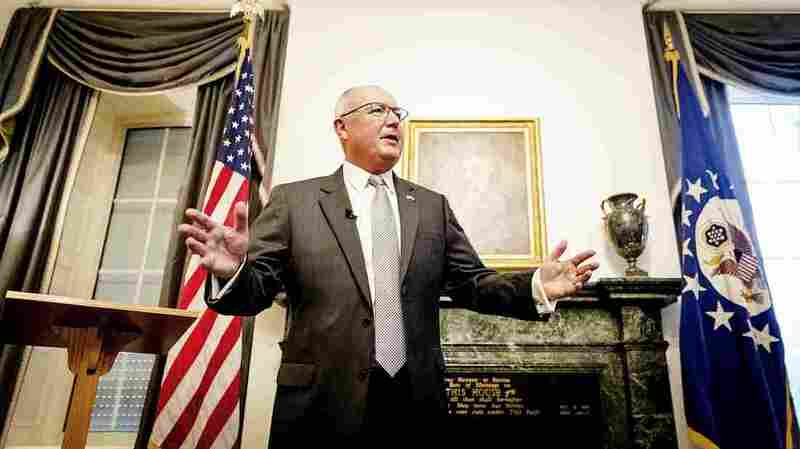 Hoekstra had an uncomfortable news conference with Dutch reporters on Wednesday after they repeatedly pressed him to clarify or retract the 2015 comments. He said he "expressed my regrets and my apology for the comments that I made. And I'm not revisiting the issue." Hoekstra eventually stopped responding to questions.
" 'The State Department does not agree with those statements. That is not the language that we would use,' the State Department's undersecretary for public diplomacy and public affairs, Steve Goldstein, told reporters in Washington on Thursday."